One of the oldest methods of firing clay is the Japanese art of Anagama. Here the elements of earth and water are brought together with fire and wood, in a culmination of the potters art, to achieve a transformation of stunning beauty. Since the fifth century the tradition of Anagama firing has been part of the potters art and the distinctive colours that are the mark of Anagama are much prized by potters and collectors alike. 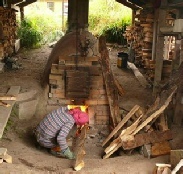 The technique has spread from Japan, and today a small but dedicated body of woodfiring potters exist around the world. Many examples of their work can be seen in museums and collections, a testament to a process that has not changed since its inception 1500 years ago. In 2001 a group of enthusiastic potters came together to build an Anagama Kiln in County Kerry in Ireland. Since then the Kiln has been fired regularly. The unpredictabilities can mean that disappointment and satisfaction often lie close together, but with every firing the techniques and possibilities of this method have been explored and the experience and skills of the group have grown. 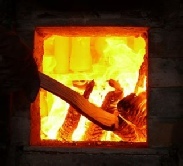 It takes five tons of carefully cut wood and the potters constant attention to reach a temperature of over 1300 degrees. After five days and nights in the firestorm of the kiln expectations run high, but the beauty of the process lies in this uncertainty and the resulting layers of natural wood ash capture the dynamics of the flame in the vibrant colours and textures that are so sought after by potters.